I find it delightful that I knew almost every word to almost every song tonight, and that I learned almost every song at Girl Scout camp (including improbable things like “The Union Maid” – who dragged that out to a bunch of 10 year olds? And why? Was it one of those days when the counselor with the guitar just ran out of songs so it just came out?) This is good stuff. This is important stuff. Do kids still learn these songs? It would make me sad if they didn’t. I know what I’m getting my niece and nephew for their next birthdays. 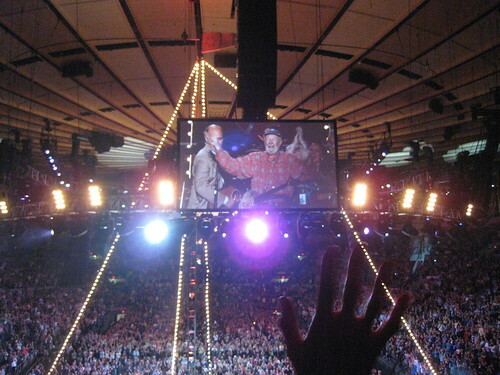 Intro – Bruce Springsteen on Pete Seeger from caryn rose on Vimeo. Ghost of Tom Joad – Bruce Springsteen and Tom Morello – ACOUSTIC from caryn rose on Vimeo.